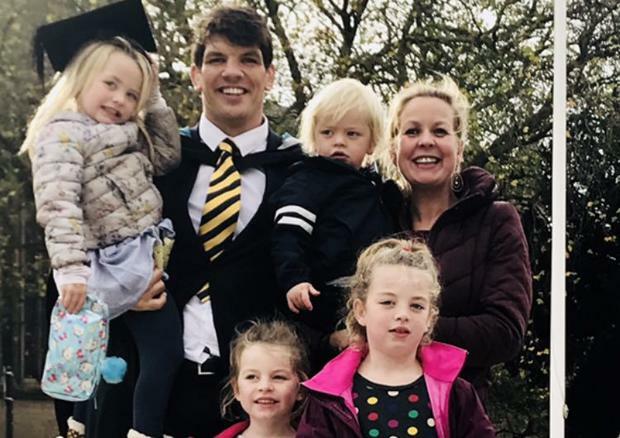 Retirement is beckoning for Irish rugby legend Donncha O'Callaghan, but he is by no means planning to put his feet up when he hangs up his boots at the end of this season. The Munster and Ireland star (38) said he will have his hands full at home with his four children - Sophie, Robin, Anna and Jake - he shares with wife Jenny and praised his other half for her dedication to their family. "With four young kids around the house, there is plenty to keep me occupied. I am a professional rugby player, but I think it is much easier to scrum, maul and get the s**t kicked out of you than hanging around with four kids for the day. I have incredible respect for my wife Jenny at home or anybody who minds children," he told RSVP Magazine. O'Callaghan is a first time coach on RTE's Ireland's Fittest Family and said he enjoys having a common show that they can all agree on. "It is crazy with three girls and my son, Jake. They are the reason I wanted to do well on Ireland's Fittest family because it is the only show we can all watch as a family and be happy. Normally, there are fights between Paw Patrol, My Little Pony and Fair City," he said. And he joked about the arrival of his two-year-old son Jake into a house filled with girls. "I will be honest with you and I love him to bits, but it is like an alien has arrived into our home. The girls are immaculately clean and love to wear nice dresses, Jake likes to eat toilet brushes and play around in mud from the garden," he said. Earlier this year, O'Callaghan said his young family was the motivation behind his decision to retire. "What I have mistaken for sacrifices is really me being selfish," he said. "So I have to prioritise my wife and my four lovely kids and make sure that I’m there for them and we have an enjoyable time and that I take my bit of the loads."